U.S. Department of Agriculture (USDA) Secretary Tom Vilsack announced final changes to increase access to healthy food choices for participants in the Supplemental Nutrition Assistance Program (SNAP). The provisions in this rule require SNAP authorized retail establishments to offer a larger inventory and variety of healthy food options. The final rule provides long overdue updates to SNAP retailer eligibility criteria. Previously, a retailer could be authorized to participate in the program with a minimum inventory of 12 items. Now, the number of required food items is expanded to a minimum of 84. These changes are in keeping with the primary purpose of the program. USDA extended the comment period for the proposed rule to ensure all interested parties had the opportunity to bring their voice to the final rule, and made significant changes to respond to those comments. The final rule announced today incorporates feedback from over 1,200 comments received and ensures the new standards will balance commenters’ concerns. In particular, in the final rule multiple ingredient foods will continue to count towards retailer eligibility. In addition, the existing regulatory requirement that specifies the threshold of hot and cold prepared foods sold that makes a location an ineligible restaurant (rather than an eligible SNAP retailer) is far more flexible than in the proposed rule. Now the requirement is nearly the same as the requirement that has been in place for some time with only a modest change to account for foods heated and consumed on site after purchase. Changes to the definition of accessory foods ensure that stores are not able to participate in SNAP by selling primarily snack foods. At the same time, the definition of variety has been expanded to make it easier for stores to meet the new requirements mandated by the Agricultural Act of 2014, and the number of each variety of staple food items retailers must have in stock has been halved as compared to the proposed rule from six to three. For more information about this final rule, please visit: http://www.fns.usda.gov/snap/enhancing-retailer-standards-supplemental-nutrition-assistance-program-snap. USDA has taken many steps in the last several years to strengthen SNAP and increase access to healthy foods. Recently, USDA sought retailer volunteers for a two-year, nationwide pilot to enable SNAP participants to purchase their groceries online. USDA also provided funding to incentivize participants in SNAP to purchase more healthy fruits and vegetables through the Food Insecurity Nutrition Incentive Program, increased farmers market participation in SNAP to improve access to fresh and nutritious food, and announced a purchase and delivery pilot, which is designed for non-profits and government entities to improve access to groceries solely for home-bound elderly and disabled SNAP participants. As the nation’s first line of defense against hunger, SNAP helps put food on the table for millions of low income families and individuals every month and is critical in the fight against hunger. 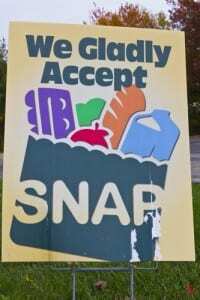 SNAP is a vital supplement to the monthly food budgets of about 45 million low-income individuals. Nearly half of SNAP participants are children, 10 percent are elderly and more than 40 percent of recipients live in households with earnings. SNAP plays an important role in reducing both poverty and food insecurity in the United States—especially among children. SNAP is an effective and efficient health intervention for low-income families with a positive impact on children beginning before birth and lasting beyond childhood years, improving health, education, and economic outcomes.